Whovian kids at Comic Con had some questions for the Doctor, so BBC helped them asked him. Hold on your questions for now, the next season starts in a few hours and you’ll have a lot of more questions to ask after that! Some of the most amazing Doctor Who cosplay at San Diego comic con 2015. Karen Gillan was interview at Denver Comic Con: she could not have been nicer or more attentive to Presley during the few minutes they had to talk to her. Her schedule was absolutely crazy, but she took the time to sit down for a few minutes and answer a few questions about Doctor Who, Guardians of the galaxy, learning to drive and playing table top with Will Wheaton. It was crazy loud in there, so the people from ActOutGames cleaned up the audio as best they could quickly, but it’s not perfect. The video was recorded by Otto Dieffenbachm, a marketing director for Flyguy Promotions, a company that specializes in building flyable objects for brands, for his team film session with October Films LTD out of the UK. The interview and video will be seen in the US on Outrageous Acts of Science and in the UK on You’ve Been Warned. About one year ago Simon Pegg and Nick Frost were asked a lot about The World’s End at Comic-Con by Dan Casey. So, the guy from Nerdist News asked the people’s question gathered from Twitter… including the one about being a Doctor Who fan. One year later, this Christmas, Nick Frost becomes Santa Clause. The event happened 21st of June, 2014. You can watch Matt Smith and Karen Gillan do the drunk giraffe and Doctor Who theme tune – the Tardis’s previous inhabitants performed their version of the show’s opening titles at last weekend’s Wizard World Comic Con in Philadelphia. This year’s Comic-Con was Jenna-Louise Coleman’s first. Enjoy watching the Eleventh Doctor Matt Smith and Whovian fans – including YouTube star Phil DeFranco and “The Guild”‘s Michele Boyd – show Jenna how to survive at the insane San Diego fan convention. Also… find out what gifts a Dalek and a Weeping Angel bestow upon the newest Companion, and how many Doctors we can fit in one room! Doctor Who made a presence at San Diego Comic-Con 2013 these days. You couldn’t get into Hall H for Doctor Who’s packed-house 50th Anniversary Panel Hall H and are you interested to find out more? Well… Watch the highlights now and get all the scoop from stars Matt Smith and Jenna Coleman, Executive Producer & Lead Writer Steven Moffat, producer Marcus Wilson, writer Mark Gatiss and “An Adventure in Space and Time” star David Bradley. Discover why Steven Moffat thinks The Doctor would be shocked to find out there’s a show about him, and what other Doctor Who characters MATT & JENNA would want to play. Plus, find out Mark Gatiss’s favorite memory from season 7, and whether they’ll ever shoot more episodes in America. And you don’t want to miss Matt Smith on how Doctor Who has changed his life, and his parting thoughts on his last Comic-Con as The Doctor. When Matt Smith cut his hair last month I had some problems in recognizing him in the video he thanked his fans. 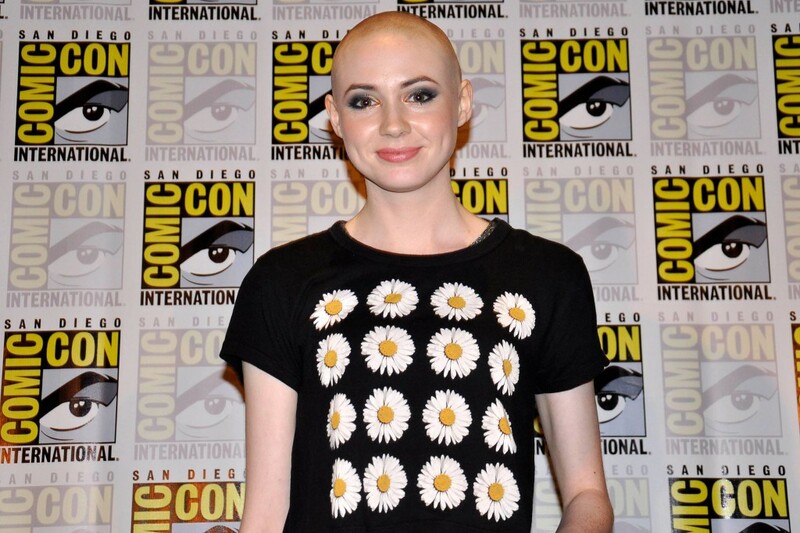 These days we all had the chance Karen Gillan bold bald head… very surprising, almost shocking for may of her fans. 😀 Girls, you have no idea what you are losing when insisting you never shave your head (at least once)… It’s an experience you should not miss. Will anyone recognize him as he chats with unsuspecting fans, poses for pictures and tours the booths? He will be the Doctor until this year Christmas special, but he’s already looking for work again: “I go back to auditioning and trying to get a job. Someone employ me.” Meantime he fancies a role in JJ’s Star Trek, but he also admits Benedict Cumberbatch is doing a great job. In the interview Mat Smith also revealed he knows a bit about this year’s Christmas special… and suggested that the new Doctor could be a woman. It’s not over for me yet, I’ve still got the Christmas special. Apparently it’s like 20 pages in, Steven [Moffat] was telling me about it last night – it sounds exciting. I don’t want to speculate too much. I feel like that’s maybe not my place to. Whoever it is will be the right actor or actress – lets wait and see who she is. It can be anyone. It can be anyone – and that’s the great thing about the part. If Helen Mirren did it or if you know, there’s so many female actresses who’d be amazing. Thousands of Doctor Who fans descended on Paris earlier this month, when Mark Gatiss and the replica First Doctor TARDIS console from An Adventure in Space and Time visited the fifth annual Paris Comic Con. You know Math Smith as the Eleventh Doctor, but he is also the youngest Doctor in the Doctor Who series.Â At MCM Comic Con London 2012, last month, Matt Smith gratefully accepts a TARDIS cake ahead of his 30th birthday. On October 26th at London’s Comic Con, Matt Smith sat down for a live Q&A along with the show’s Executive Producer, Caroline Skinner. From the Excel Centre in London, Matt and Caroline answered questions from the packed auditorium and also from our amazing YouTube fans! Tell me, have you been to London Comic Con lately? Perhaps in the crowd Matt Smith started to film there? Now you can get a glimpse toÂ Matt Smith’s point of viewÂ as the BBC team present there gave Eleventh Doctor a camera to take on stage with him at London Comic Con on Friday where he filmed the 1000 deep crowd sharing their love for Doctor Who! As it has been reported byÂ ScienceFiction.com, Matt Smith, Arthur Darvill, Karen Gillan, Steven Moffat and Caroline Skinner will have a panel and a Q&A at this yearâ€™sÂ San Diego Comic Con. The Doctor WhoÂ presence will happen Sunday July 15th between 12:30-13:30 in Hall H,Â there will also be new footage from Series 7 airing on the big screens! BBC AMERICAâ€™s (@BBCAMERICA) Doctor Who stars Matt Smith and Karen Gillan make their triumphant return to Comic-Con for a panel and Q&A moderated by Doctor Who pundit and creator of theNerdist, Chris Hardwick. They will be joined by star Arthur Darvill, whoâ€™s making his first pilgrimage to SDCC, along with award-winning lead writer and executive producer Steven Moffat (Sherlock) and award-winning executive producer Caroline Skinner (The Fades). As fans eagerly await the new seasonâ€™s premiere, BBC AMERICA has learned that Steven Moffat and team will be bringing something very special with them to reveal to fans in Hall H.